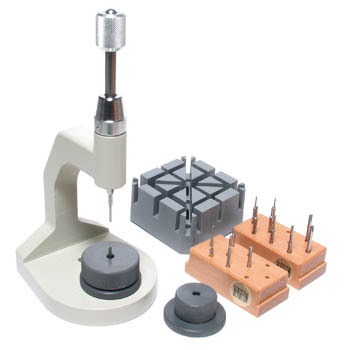 This multi-use tool lets you drive watchband pins and screws in and out with ease. The sturdy base maintains a good support for leather and metal bands, and the two holders allow adjustment for all sizes of bands. Includes Base, Broach with drum, 2 Holders with adjustable height, Set of 10 Blades on wooden stand, and Set of 6 Pins on wooden stand. Swiss made.